Is the new processor chip from AMD an update in name only? The AMD FX-6350 is the update to the budget gaming chip of choice from the Piledriver generation. But if you were underwhelmed by the technical advances in the new desktop Haswell chips, prepare to be resolutely indifferent to what this new FX CPU from AMD offers. For £89 (AU$146, US$136), the FX-6300 was a great little chip, offering a decent chunk of true multi-threaded performance to boost what it sorely lacked in single-threaded oomph. The Piledriver update didn't deliver the technical boost the individual Bulldozer "cores" needed to match the gaming prowess of competing Intel chips, but when you took the savings on the platform as a whole into account you could pair up this budget CPU with a better GPU than you could with a Core i5 Ivy Bridge chip. The AMD chips can't compete at the top-end yet, but down the price-scale you can get a lot for your money. So, what does this update to that great little chip offer? Sadly not a great deal. The FX-6350 is a little more expensive and you get a higher base clock boost from 3.5GHz to 3.9GHz, but the turbo speed only gets a modest 100Mhz hike up to 4.2GHz. Still, that offers a fair chunk more multi-threaded performance with the X264 score going up from 26fps on the FX-6300 to 33fps with the FX-6350. While the stock-clocked performance starts to make this new update tempting for budget builders, the fact that it comes nowhere near the performance of the original chip when it comes to overclocking is disappointing. We were able to happily run the FX-6300 at 5GHz - where it gets a Cinebench score to rival the Haswell i5 4670K - but the new FX-6350 taps out at a disappointing 4.6GHz. In the situation of a budget build, however, stock performance is probably more important. That's especially true given the sort of high-end AMD motherboard you'd need to actually hit those heady overclocking highs. None of that really helps the gaming performance, with these Piledriver chips still lagging massively behind the Intel CPUs in terms of single-threaded grunt. Even the non K-series Haswell i5 is a virtual mile ahead of the FX-6350 in terms of in-game performance. All GPUs being equal, the AMD chip is going to hold back your graphics card in comparison to the performance you could get in combination with an Intel CPU. With the FX-6300 still available for a good chunk less than this updated silicon, it's tough to recommend this chip. 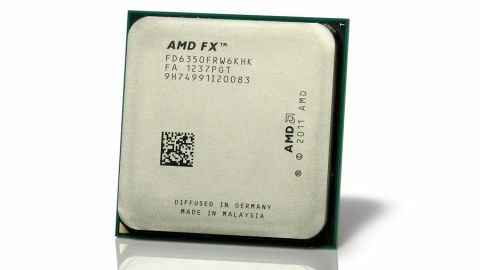 For our money the FX-6300 is a more worthwhile Piledriver chip, and we'll be waiting until next year to see what a proper six-core Steamroller FX chip can deliver.